Home » Language » Why Should I Learn Italian? Why Should I Learn Italian? “La bella lingua” is appreciated all over the world as one of the most beautiful spoken languages. It is the 8th most spoken language in the United States largely due to a high rate of immigration of Italians during the late 19th century. It is also the 2nd largest ethnic market in the United States and the largest in New York. Add in the fact that Italy is the 8th largest economy in terms of gross domestic product (GDP) and it is obvious that Italian is a very powerful language to know both in the United States and all around the world. Everyone who appreciates the art, architecture, and culture of Italy has dreamed of learning Italian. There are numerous enriching books about art and architectural history that are simply not available in English and to fully understand Michelangelo, Bernini, or da Vinci one must know Italian. Learning Italian will allow you to fully delve into the intricacies of Italian history and culture that are only available in their original language. It will also vastly enhance any future trip you plan to take to Italy. You will be able to visit cathedrals, the Vatican, the Coliseum, and many more famous markers of Italian culture, as few outside of Italy are able to. Knowing the language will allow you to communicate with locals who can point you towards many of the amazing local restaurants featuring the famous Italian cuisine that would otherwise be passed by without a second glance. Knowing the language of the country you are visiting is an important step towards fully appreciating the culture and the country’s citizens. 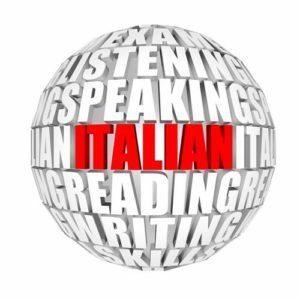 Knowing Italian will also improve your resume and can lead to future jobs in government or business. The United States and Italian governments are always looking for qualified linguists who can help facilitate communication between the two countries for either trade or diplomacy. With the economy of Italy also being so large there are many opportunities for Americans who speak Italian to go and work for Italian businesses who are looking for English speakers to head departments such as exports. By learning Italian you will not only improve your chances of finding a job, you will create an opportunity to explore an exciting career in a foreign country. Furthermore, Italian is considered an easy language to learn, much easier than other romance languages such as French and Spanish. With Italian, you will learn a foreign language that will open doors for you in the realms of art, gastronomy, fashion, business, and government, and you will learn it quickly! Have you studied Italian? What have you gained most from speaking the language? Big-government economics breeds crony capitalism. It’s corrupt, anything but neutral, and a barrier to broad participation in prosperity.